272 pages | 7 B/W Illus. For the Latino population, the family bond is powerful and enduring. Family serves as the primary source of support, care, guidance, and healing; all difficulties that arise for an individual are surmounted together. Therefore, a practitioner working with a Latino client must gain the trust and respect of the family in order to carry out treatment efficiently. He or she must essentially become a part of that family to encourage members to share their issues without the concern of breaching the confidence of the family. Counseling and Family Therapy with Latino Populations helps the therapist to join the Latino family in order to identify and explore the difficulties that threaten their welfare. With this fundamental principle as the basis, the book's editors and contributors write chapters that focus on work with children and adolescents, group counseling and substance abuse counseling. They incorporate specific case studies, methods, and strategies for intervention and provide insight into the cultural relevance behind each example. 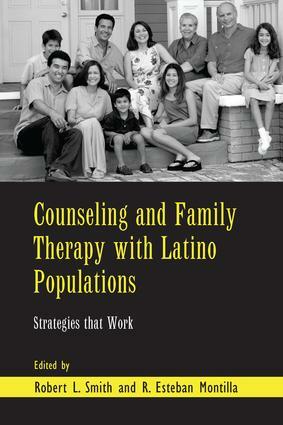 This book is a necessary resource for therapists working with Latino clients who wish to offer effective techniques while continuing to value the integrity of family tradition. Contributors. Series Editor's Foreword. Preface. Part I: An Overview. Smith, Bakir, Montilla, Counseling and Therapy with Latino Families. Montilla, Smith, Working with Latino Populations: Background and Historical Perspectives. Falicov, Family Organization: The Safety Net of Close and Extended Kin. Minuchin, The Family in Therapy. Part II: Strategies that Work with Latino Populations. Arredondo, Multicultural Competencies and Family Therapy Strategies with Latino Families. Cueva, Counseling Latino Children. Southern, Counseling and Family Therapy with Latino Adolescents. Zumaya, Couple Counseling with Latinos. Guerra, Group Counseling with Latino Populations. Bain, Parenting and Latino Families. Southern, Sexual Counseling with Latino Couples. Part III: Research and Conclusions. Smith, Bakir, Ricard, Contemporary Issues and Research. Robert L. Smith, Ph.D., FPPR, is Professor and Doctoral Program Coordinator in the Department of Counseling and Educational Psychology at Texas A&M University - Corpus Christi. Dr. Smith is also Executive Director of the International Association of Marriage and Family Counseling. Rómulo Esteban Montilla, D.Min, BCPC, is Clinical Pastoral Education Supervisor at Driscoll Children's Hospital in Corpus Christi, Texas.